The 2020 recruiting class is starting to take shape. The Gamecocks have already received commitments from five players. 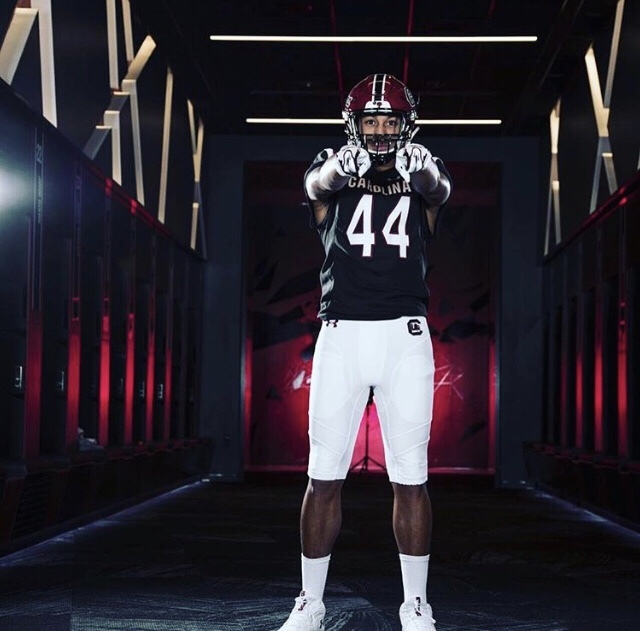 There are a number of other big names still out there that have their eyes set on South Carolina; including a few five stars. Reggie Grimes is a five star defensive end/ outside linebacker from Mount Juliet, Tennessee. Yesterday Reggie announced the final six schools that he is considering. The final six include Alabama, Florida State, LSU, South Carolina, Tennessee, and Vanderbilt. Will Reggie Grimes Commit to South Carolina, LSU or Alabama? There is a chance that Reggie Grimes will commit to the University of South Carolina. He and his father both seemed to enjoy their visits to South Carolina. Reggie Grimes would be a great addition to our defense at the linebacker position. Unless he bulks up a bit, I think the best place for him will be outside linebacker. As of now Reggie Grimes has a couple of good offers to choose between. The current crystal ball prediction is that Reggie is leaning toward Alabama. This prediction is probably accurate to some extent. What defensive player wouldn’t want to go play for Saban? But that doesn’t mean that there is no chance that Reggie will choose another school. Outside Bama, I think his two best options would be South Carolina and LSU. As we get more information we will keep you updated on the recruitment of Reggie Grimes.